For the best family skiing in New England, see our favorite family ski resorts in Vermont, Maine and New Hampshire, plus Massachusetts. We have skied the major ski resorts in the East. These top New England ski resorts offer great ski trails and lifts, snowmaking and grooming, kids learn to ski programs, family friendly lodging and dining, and activities from après ski and tubing to horse drawn sleigh rides, fireworks and torchlight parades. Stowe is the best, The Ski Capital of the east is best saved as a destination once your kids get bigger, and everyone can do justice to this vertical venue. The legendary Front Four on Mansfield will humble even the most boastful teen. Stowe is now a Vail Resort, part of the Epic Pass. On snow Stowe specialties include summit dining at the European-style Cliff House, even non-skiers can arrive by gondola, and the impressive ski in ski out Spruce Peak Village. Stowe Mountain Lodge, also called the Spruce Peak Lodge, is a five-star hotel with an interconnecting gondola whisking skiers across the Notch from Mt Mansfield’s slopes to the Village with its ice rink, shops, luxury hotel with spa, outdoor pool and ski concierge. Stowe’s Mountain Road is also loaded with après ski fun, shopping, dining as yuo head down the valley to the quaint Stowe Village. This Maine resort makes serious snow, pretty much guaranteeing your whole gang good skiing from November to April. With eight interconnected peaks, 870 acres, and modern lifts, night skiing, and two ski-in ski-out hotels book-ending the vast ski terrain – you are in a happy place. Sunday River is family friendly with events all winter long, a base to peak Chondola with Peak dining select evenings, and excellent lesson programs. Sunday River also has two on-mountain grand hotels with outdoor heated pools. There’s more outdoor fun too – a zip line, cross-country and dog sledding, tubing and fireworks on weekends and holidays. The funky town of Bethel is great for browsing Maine craft shops, or grabbing a bite off mountain via the free Mountain Explorer shuttle. Did we mention mascots Eddy & Betty the Yeti? Your kids will love Sunday River too. You can’t beat staying at the elegant Hotel Mount Washington for a winter getaway. Skiing next door at Bretton Woods, NH’s largest ski area, is a treat for the skis and the eyes, featuring well-groomed snow, low-angle glades, and dramatic views of the highest peak on the Eastern Seaboard, Mount Washington at 6,288’. Bretton Woods has elegantly groomed scenic trails, a few punchy birch-line glades, plenty of terrain served by 10 swift lifts, a new gondola and beautiful and summit base lodges, plus one of the country’s best Canopy Tour zip lines. 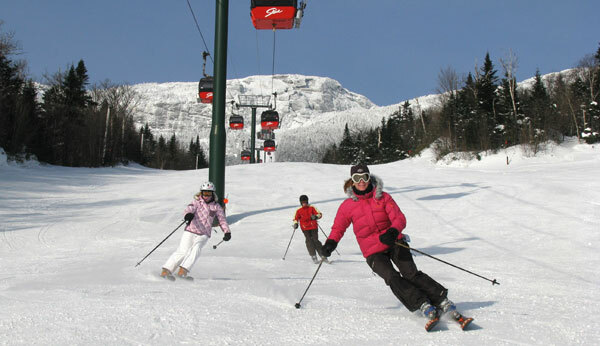 If you are looking for the latest ski programs, Smugglers’ Notch Resort is the leader in family learn to ski and ride lessons. Whether its skiing with your child in their unique ‘Mom & Me’ lesson, or teaching your ‘Little Rascal,’ to start skiing at age two, Smuggs’ has the most innovative instruction in snow country. The only thing you won’t find at Smuggs’ are modern high-speed lifts, but they still hoard the family ski resort awards. Condominiums flank Smugg’s slopes along the beginner terrain of Morse Mountain. Resort guests find tons to do in the Village after the lifts close from the Fun Zone to snow tubing. Smugglers’ is also home to treasures of expert terrain on Madonna Mountain for parents who want to drop in after they drop off their kids at ski camp or day care. Sugarloaf is one big mountain, with one strong allegiance. Sugarloafers are as loyal and legion as they come. The warm welcome you receive here separates this Maine mountain oasis from the others both spiritually and geographically. The 1,053 acres of terrain here is hearty (biggest in the East), and so is the social life so far north – drawing skiers to its snowy pulpit. Sugarloaf throws weekly themed parties for families in the rustic but real base village, where Bag Burgers and brews and tunes are served by Sugarloafers. A cast of woodsy Sugarloaf mascots like Amos the Moose, Blueberry Bear, and Pierre the Logger keep your kids smiling, making up for the long “are we there yet?” drive to The Loaf. Despite Killington’s reputation as the sprawling Beast of the East, recent improvements to Ram’s Head and Snowshed Family Adventure Center make the Big-K more amiable for families. Killington’s six mountains of terrain are covered in super snowmaking power allowing them to open first in the East in October (2018-2011) and ski until May. Killington has something for everyone in your pack. Bear Mountain is devoted to freeskiers and riders with all tons of parks and pipes, and Killington Peak has classic trail skiing. There is plenty of lodging at Killington from the on mountain Killington Grand Hotel and condos to inns and motels along the Mountain Road. . Killington Resort timeshares provide guests with large condo rentals complete with full kitchens, jacuzzi tubs, free wifi, TV, separate bedrooms, private balconies, and more. 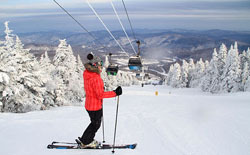 While skiing Killington, a side trip to sister resort Pico is ideal for families looking for one single panoramic peak with un-crowded trails funneling to a friendly base. Pico has a Vermont-syrupy flavor – the antithesis of big-brother Killington, the Big K and Beast of the East. In Vermont’s beautiful Mad River Valley is this one great ski resort made up of two mountains – Lincoln Peak and Mt Ellen. Sugarbush offers challenge on au natural Castlerock, classic groomed runs like Jester, bumps on Steins and FIS and plenty of family friendly terrain and kids ski and snowboard camps too. Lodging at Sugarbush’s on mountain Clay Brook Inn in Lincoln Village is super convenient for families with an outdoor heated slope view pool, you can walk to ski camp, childcare, the lifts, dinner and après ski. Sugarbush also has lots of condos and charming inns like The Pitcher Inn throughout the Mad River Valley, Waitsfield and Warren. Easy to get to off I93, Loon is a great family area with on mountain lodging, and excellent learning programs. Loon offers skiers and riders three separate peaks, the highest at 3,050′, modern lifts and three base areas from North Peak to South Peak. Parents will like the beautiful White Mountains views, kids will like Loon’s terrain parks. For slope side resort hotel lodging, the Mountain Club at Loon is the place, or the new Riverwalk at South Peak. Après ski at Loon, the town of Lincoln is your playground with movie theatre, shopping, ski shops and family restaurants. Or stay on the mountain, send the kids to Loon’s Adventure Center with climbing wall and toys, while you enjoy Paul Bunyan’s pub. New Hampshire’s third largest ski resort, Attitash and sister ski resort 20 minutes away Wildcat make for a great weekend of family skiing in the Mt Washington Valley. Attitash has two big interconnected mountains for skiing and riding, with everything from long winding trails like Tightrope to exciting glades, and a monster pipe. The whole family will enjoy Attitash for its diversity and its proximity to North Conway’s shops, dining and amusements. 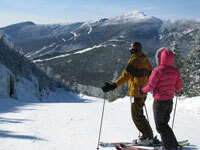 At nearby Wildcat, on the same lift ticket, the views of Mt Washington are spectacular. Wildcat does not offer on mountain lodging. Attitash is the more full service ski resort with a huge Learning Center, plus an on mountain Attitash Grand Summit Resort Hotel with an outdoor heated pool. Or stay in the quaint town of Jackson at The Wentworth or Eagle Mountain House, or one of many inns, motels or resorts in North Conway. While not in New England, Tremblant is worth the drive for New Englanders. Tremblant is like Disney on snow with a delightful European ski village, and a very cheery ski school staff. Its like visiting the Alps without the airfare. 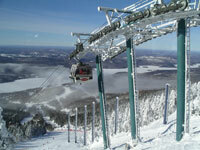 The 654-acre ski area offers three sides of skiing and riding, speedy lifts, and scenery of Lac Tremblant. Families will love the lively pedestrian village, the multitude of restaurants and shops, and La Source – the indoor water park for a family après ski swim. Adults will find the best après ski this side of the pond. Tremblant gets busy on weekends and holidays due to it proximity to Montreal, but that’s just more joie de vivre! For folks from the south (southern New England that is), you can’t beat Jiminy Peak for proximity. With a beautiful Village Center, Children’s Learn to Ski and Ride Center, all-suite Country Inn lodging, and well-groomed terrain served by a six-pack chair, Jiminy Peak Resort in Massachusetts is a top spot for young families from south of the Vermont border.